Bismack Biyombo could be hanging out in Hollywood, putting his large feet in Caribbean sand or enjoying the nightlife of Miami Beach now that his NBA season is over. 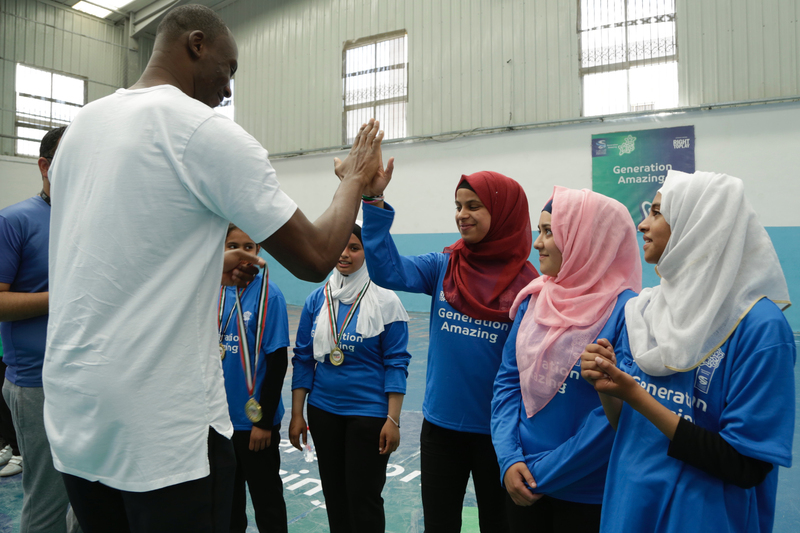 Instead, the Orlando Magic big man is in the Middle East, where he is spending time with children in refugee camps in Jordan and talking hoops in Palestine through the Right To Play program. “What can I do? How can I help these kids? There are kids in that area who have never had a chance to talk to an NBA player. It always excites me to hear from them to learn what they dream about. I also want to be a good global athlete, not just an athlete who wears a jersey and gets out there and plays basketball and then retires,” Biyombo, 24, told The Undefeated. Right To Play is a global organization committed to improving the lives of children and youth affected by conflict, disease and poverty. The program was established in 2000 with a play-based approach to learning and development with a focus on education, life skills, health, gender equality, child protection and building peaceful communities. Right To Play is operating in 20 countries with a goal of aiding 1 million children each week inside and outside of the classroom. Right To Play named Biyombo as a global athlete ambassador on April 22. He is visiting Jordan and Palestine this week through the program along with Roy Rana, who coaches the Canadian junior national men’s basketball team and also coaches the Nike Hoop Summit World Team. • A play day at Baqa’a camp, which is one of six “emergency” camps set up in 1968 to accommodate Palestinian refugees and displaced people who left the West Bank and Gaza Strip after the 1967 Arab-Israeli war. • Participating in a Learning for the Empowerment and Advancement of Palestinians (LEAP) workshop in Zarqa, Jordan. LEAP is an educational empowerment program for Palestinian refugee youth dedicated to nurturing the intellectual growth and creative curiosity of students. • Participating in the Taalom Project in Hashmi-Amman, Jordan, which is a program improving the quality of and access to pre-primary and elementary education for 27,000 children ages 3 to 18. • Meeting with the Embassy of Canada in Jordan and also playing basketball with a youth club there. • Visiting a refugee camp and public school in Jordan. • Meeting with the Palestinian Basketball Federation and possibly the Palestinian Ministry of Education. “Bismack Biyombo is a world-class athlete and basketball player and a humanitarian who has dedicated his time and money to supporting children from around the world to overcome the challenges of conflict, poverty and disease,” Right To Play CEO Kevin Frey told The Undefeated. “We are excited to have Bismack as part of the Right To Play team and to introduce him to our work where we use different forms of play, including sport, to protect, educate and empower children and youth. This trip to the Middle East will allow Bismack to experience the transformational power of play in the lives of refugee children who have lost their homes, their schools and so much of their lives to conflict and violence. Biyombo is visiting the Middle East for the first time since living there before coming to the NBA. Bismack Biyombo Sumba was born on Aug. 28, 1992, in Lubumbashi, a copper mining city of about 1.5 million people in the Democratic Republic of Congo. His parents struggled to find work and gave him the bare necessities as a child. Biyombo was recruited to play basketball professionally in Qatar at age 16 but never made it, as he was temporarily jailed in Tanzania because of a lack of proper documentation. 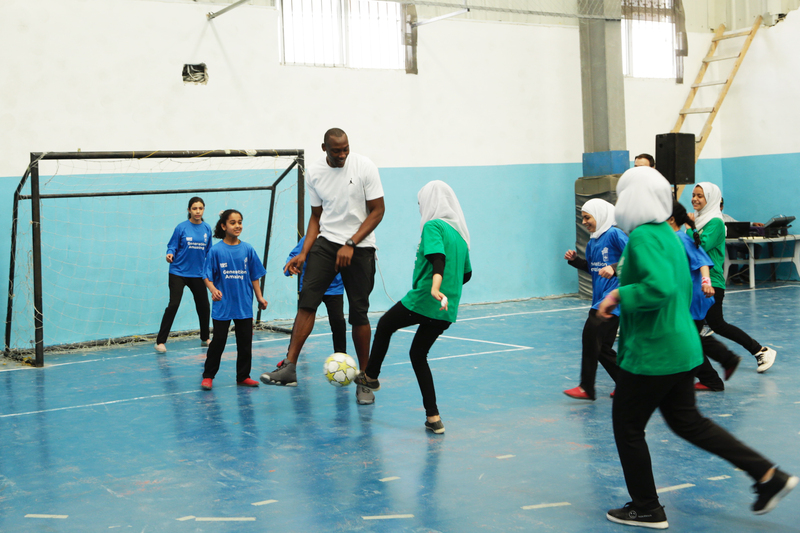 Biyombo’s next stop, for nearly eight months, was Yemen, where he played for a local basketball team. After playing well for a Yemeni team in a youth tournament in Jordan, he landed a job in Spain from 2009-11. The Sacramento Kings selected him in the 2011 NBA draft after his strong showing in the Nike Hoop Summit. His rights were dealt to the then-Charlotte Hornets. The 6-foot-9, 229-pounder has played for the Hornets, Toronto Raptors and Magic, but he will never forget that his basketball career started in the Middle East. “I’m pretty excited, because it’s the first time I’m going back to that area since I left,” Biyombo said. “I’m also going back for a good cause other than playing basketball. I think more about the good than the bad. When I got there, I was just a young kid trying to find his way in his life. Obviously, the people I got to meet there treated me extremely well. Biyombo said after signing a four-year, $70 million contract with the Magic last summer that he plans to continue donating money to build schools in the Congo and aid in other ways. He also is expected to make his annual visit home in July before playing for Team Africa against Team World in the second NBA Africa Game on Aug. 5 in Johannesburg. While the Congo native is a proud African, he believes he must give back to the world.